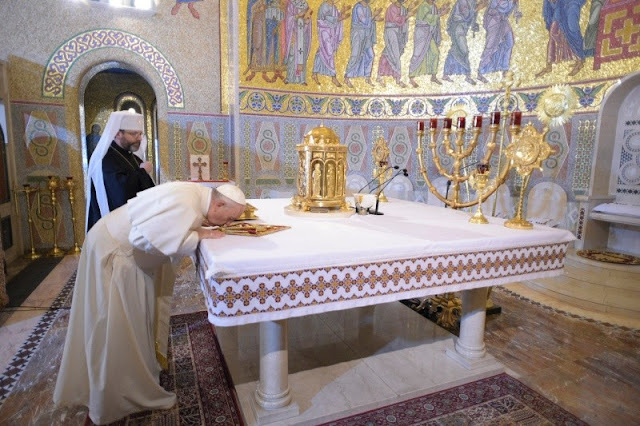 Pope Francis visited the Ukrainian Greek-Catholic community that lives in Rome and prayed at the tomb of Salesian Ukrainian Bishop Stepan Czmil. He visited the Basilica of Santa Sofia home to Rome’s Greek-Catholic Community of Ukrainians. The Pope exchanged greetings with the Major Archbishop of Kiev, Sviatoslav Shevchuk, and in his address the Ponfiff recalled the great models of Cardinal Josyp Slipyi, Salesian Ukrainian Bishop Stepan Czmil, and Cardinal Lubomyr Husar, former Major Archbishop of the Greek-Catholic Church of Ukraine. Thank you so much for the invitation, for your presence, for the reception, for your joy. I came to pray with you and to visit you. I invite you, before entering, to make a prayer for peace in Ukraine. Dear Brother Sviatoslav, dear Bishops, priests, brothers and sisters, I greet you cordially, happy to be with you. I thank you for your welcome and for your faithfulness, fidelity to God and to the successor of Peter, who has often been paid dearly. Entering this sacred place I had the joy of looking at your faces, hearing your songs. If we are here, gathered in fraternal communion, we must give thanks also to many faces that we no longer see now, but which have been a reflection of God's loving gaze on us. I think, in particular, of three figures: the first is Cardinal Slipyj, whose hundredth and fifth anniversary of his birth was mentioned in the year just ended. He wanted and built this luminous Basilica, so that it would shine as a prophetic sign of freedom in the years when access to many places of worship was prevented. But with the sufferings suffered and offered to the Lord he helped to build another temple, even bigger and more beautiful, the building of living stones that you are (cf. 1 Pet 2: 5). A second figure is that of Bishop Chmil, who died forty years ago and is buried here: a person who has done me so much good. It is indelible in me the memory of when, as a young man - I was twelve - I attended his Mass; he taught me to serve Mass, to read your alphabet, to answer the various parts ...; from him I learned, in this service at Mass - three times a week I did it - the beauty of your liturgy; from his stories the living testimony of how much faith has been tried and forged in the midst of the terrible atheistic persecutions of the last century. I am very grateful to him and to your many "heroes of faith": those who, like Jesus, sowed in the way of the cross, generating a fruitful harvest. Because the true Christian victory is always in the sign of the cross, our banner of hope. And the third person I would like to remember is Cardinal Husar. We were made cardinals the same day. He was not only "father and head" of your Church, but guide and older brother of many; She, dear Beatitude, carries it in her heart, and many will preserve her affection, kindness, vigilant and prayerful presence for ever. Blind, but looked beyond. These witnesses of the past have been open to the future of God and therefore give hope to the present. Several of you may have had the grace to know them. When you cross the threshold of this temple, remember, remember the fathers and mothers in the faith, because they are the bases that support us: those who have taught us the Gospel with life still orient us and accompany us on the journey. The Major Archbishop spoke about the mothers, the Ukrainian grandmothers, who transmit the faith, they transmitted the faith, with courage; they have baptized their children, their nephews, with courage. And even today, [it is great] the good - and I say this because I know it - the good that these women do here in Rome, in Italy, caring for children, or as carers: they transmit faith in families, sometimes lukewarm in experience of faith ... But you have a courageous faith. And I remember the reading of last Friday, when Paul tells Timothy: "Your mother and your grandmother". Behind each of you there is a mother, a grandmother who has transmitted the faith. Ukrainian women are heroic, really. We thank the Lord! In the journey of your Roman community the stable reference is this rectory. Together with the Ukrainian Greek Catholic communities throughout the world, you have clearly expressed your pastoral program in one sentence: The living parish is the meeting place with the living Christ. Two words I would like to emphasize. The first is meeting. The Church is meeting, it is the place to heal loneliness, where to overcome the temptation to isolate oneself and to close oneself, where to draw strength to overcome the withdraws on oneself. The community is then the place where to share the joys and hardships, where to carry the burdens of the heart, the dissatisfactions of life and the homesickness. Here God is waiting for you to make your hope ever safer, because when you meet the Lord everything is crossed by his hope. I wish you to always draw bread here for the journey of every day, the consolation of the heart, the healing of wounds. The second word is living. Jesus is living, he is risen and alive and so we meet him in the Church, in the Liturgy, in the Word. Every one of his communities, then, can only smell of life. The parish is not a museum of memories of the past or a symbol of presence on the territory, but it is the heart of the Church's mission, where we receive and share new life, that life that overcomes sin, death, sadness, every sadness, and keeps the heart young. If faith is born of the encounter and speaks to life, the treasure you have received from your fathers will be well guarded. In this way, you will know how to offer the priceless goods of your tradition to the young generations who welcome the faith, especially when they perceive the Church as close and lively. Young people need to perceive this: that the Church is not a museum, that the Church is not a sepulcher, that God is not a thing there ... no, that the Church is alive, that the Church gives life and that God is Jesus Christ in the midst of the Church is Christ living. I would also like to address a grateful thought to the many women - I spoke a little bit about this, I repeat - that in your communities they are apostles of charity and faith. You are precious and bring in many Italian families the proclamation of God in the best way, when with your service you take care of people through a caring and unobtrusive presence. This is very important: not intrusive ..., [made of] testimony ... And then [makes it say]: "This woman is good ..."; and faith comes, faith is transmitted. I invite you to consider your work, tiring and often unsatisfactory, not only as a job, but as a mission: you are the points of reference in the lives of many elderly people, the sisters who make them feel they are not alone. Bring the comfort and tenderness of God to those in life who are ready to prepare for the meeting with him. It is a great ministry of proximity and closeness, pleasing to God, for which I thank you. And you, who do this job as carers of the elderly, see that they go beyond, and perhaps forget them, because another comes, and another ... Yes, remember the names ... But they will open the door for you, up there , they will be them. I understand that, while you are here, the heart beats for your country, and not only beats of affection, but also of anguish, especially for the scourge of war and economic difficulties. I am here to tell you that I am close to you: close with your heart, close with prayer, close when I celebrate the Eucharist. There I beg the Prince of Peace for silent weapons. I also ask you that you no longer need to make huge sacrifices to keep your loved ones. I pray that hope may never be extinguished in the hearts of each person, but the courage to go forward, to always start again, is renewed. I thank you, on behalf of the whole Church, while to all of you and to the people you bring into my heart I give my Blessing. And I ask you please do not forget to pray for me. before going to bed, I kiss the Madonna of the tenderness that your Archbishop gave me, and in the morning also, I greet you. So you can say that I start the day and finish it "in Ukrainian". And now I invite you to pray to Our Lady and I will give you the blessing, which I would like to give together with your Archbishop. Hail Mary, ... [Blessing] Final greeting to the Ukrainian community gathered outside the Basilica of St. Sofia Dear brothers and sisters, I thank you very much for your warm welcome. I remain with my heart full of joy for this meeting. Thank you for your perseverance in faith. Be steadfast in the faith! Keep the faith received from your ancestors and pass it on to your children. It is the most beautiful gift that a people can give to their children: faith, faith received. The Lord blesses you. And pray for me [they say, "Yes!"] But in favor, or against? ... [they reply: "In favor!"] Keep on praying for me. I will continue to pray for you, to begin and finish the day "in Ukrainian" in front of Our Lady who gave me the Archbishop [Shevchuk] in Buenos Aires. I give you the blessing. We ask the Madonna, together. "Hail Mary ..." [Blessing] Courage, and forward!